Korea, to some Americans, is a land of gooks. Every one knows vaguely, but no one specifically, what a gook is. Perhaps a gook is any one other than a North American, but he is, more especially, an Oriental: a native of any of the South Pacific islands, a Filipino, a Japanese, a Chinaman, or a Korean. He is one whose turn of mind is not Western or American. He is one whose culture is so different that the average American cannot understand him. Gook is sometimes used to belittle; but it is also used to express familiarity and even fondness, as "Hello, Joe!" is used by the American in greeting the Filipino, or the Filipino the American. On that day I was taken to the hospital, the G.I. who drove the ambulance raved at the “damned gooks” and tried to scare them by swerving as close to them as he could without actually hitting them. 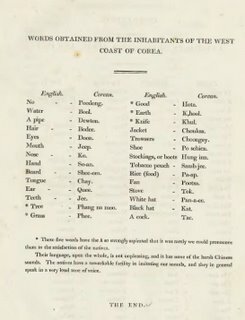 “Gook” was the term of contempt used by nearly all G.I.’s. I protested tagainst the attitude and actions of the ambulance driver, pointing out that after all this was their country and we were merely temporary visitors. But he declared that all “gooks” were stupid fools who never watched where they were going. I am sad to say that this was the most common attitude that I observed among G.I.’s. This feeling came from the fact that for years under the Japanese, Koreans had been accustomed to look for traffic coming from the opposite direction, because with drive controls placed on the right side in cars, Japanese cars drove on the left side of the road. 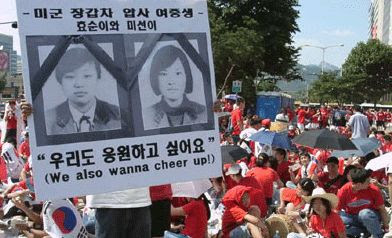 Americans had changed the traffic rules, but the habits of years could not be so quickly changed by the Korean people. Many Koreans were killed by American cars, and too often this was when they became frightened and confused by the contemptuous yells and swerving of cars by the American drivers, like my ambulance driver. I do wonder if racially derogatory words like jokballi in Korean (a derogatory name for Japanese) carry the same weight as they do in English, considering the whole 'homogenous race' situation. Would most other people be shocked by someone using such a word as we are here by the use of the word 'gook'? But Korea is more than a land of gooks: it is a land of insuperable beauty. Over one who has an irrepressible urge to see the ends of the earth, Korea casts a spell: Korea gives a warm welcome to the man who follows the sea up the long rivers, often yellow, past bald or wooded hills or mountains, into the safe anchorages. Korea is as grand in natural scenery as Switzerland, with its Everwhite Mountains in the far north, its Diamond Mountains fringing the eastern seaboard, and its numberless cascades and overhanging rocks all endowed with life by the Korean. Korea is the strongest link between the East and the West. It is worth knowing. If the American is as keen in his desire to know Korea as the Korean is to know America, the West will come to understand the East and the East the West, and, because of such knowledge, each will be enriched. The Korean woman is the earthly reflection of heavenly feminine beauty. Her lustrous black hair is simply parted in the middle and neatly tucked up in back. Her complexion is that of the wax cherry: the translucent skin is the color of ancient ivory; the cheeks are almost crimson. Unlike the highly cosmeticized Japanese woman, the Korean woman has a natural color which would be debased through the use of artificial appliances. The Korean woman, when referred to as belonging to the yellow race, tartly replies to the American, "Am I not as white as you?" And it must be admitted that the contrasting black hair and ivory skin create an effect of whiteness not found in most Americans. The cheekbones are slightly elevated and the eyes slightly almond-shaped, but not to the extent found in either Chinese or Japanese women. The face is well molded. There is little of the suggestion of the full moon found in the face of the Chinese, and the forehead is not so broad as in the Japanese face. The teeth are extremely well formed, not large like those of the Chinese woman or protuberant like those of the Japanese woman. Although the eyes are almost black, they are not coquettish like those of the Chinese woman or brazen like those of the Japanese woman. The general expression of the face is that of quiet dignity. The dress of the Korean woman is like the Korean woman: both have a simple elegance. Until she is sixty-five, when she begins to wear a little cap, she wears no headdress except occasionally a scarf over her perfumed hair. Her outer garment, worn seldom, is a long cloak with sleeves. Her upper garment, of silk or cotton, is much like a man's vest, of the same cut and length, the two sides being ordinarily tied together at the throat with a bow. The skirt, bell-shaped, wide and shirred, reaches the ankles. A thin cincture is often placed about the waist. Sometimes the upper garment violently contrasts with the lower garment, one being yellow and the other red. Often one is an offshade of the other, the upper garment being white-gold in color, for example, and the skirt being green-gold. On the tiny feet, flexible rubber shoes are worn, not unlike the overshoes of the American woman which cover only the soles of the shoes. The hose, the length of which only husbands know, are of white cotton. 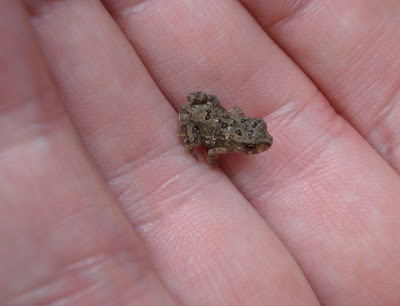 When she walks her halting but nervous gait, a series of miniature skips, her feet are like two sable snails alternately peeping out of albino shells and hastily withdrawing themselves. Her whole body is like an ancient beeswax candle on a Buddhist altar, yellowing but upright and regal. The Korean woman has little of the sprightly humor of the Chinese woman. Her reason for being is to make the men of her family happy, and no man can say that the reason is not a good one. Occasionally she joins a conversation with men and sometimes she even titters embarrassedly, but usually she is not animated. She can, however, like the Korean man, rouse herself to resolute activity and become an obstinate partisan, especially in politics. She is a blend of humility and pride ; she is like amber ashes suddenly emitting a spirited flame. The blend of Ainu, Mongol, Manchu, and Malay in the Korean man, as in the Korean woman, has produced a handsome human animal. He is quite tall and broad-shouldered and lithe. But his face is not placid like that of the Korean woman. It usually bears an expression of puzzlement, which is often mistaken for incomprehensibleness. Given equal opportunities, however, the Korean is at least as intelligent as other Asiatics or as Europeans or Americans. The Korean man is, however, an enigma. He is splendid company convivially, for he can be gay and humorous; but he can be aroused easily to a bull-like fury that will admit no limits to his arena. He can be the most gentle of men but the dirtiest of fighters. A formal meal in a Korean restaurant or hotel is frequently attended by men only. On the left of each man a keisang, or Korean entertainment girl, sits. In addition to belonging to her union, the keisang must be a graduate of the keisang school, in which she is taught to serve, to sing and dance, to arrange flowers, and to make herself generally attractive to men, which she succeeds abundantly in doing. The keisang will eat and drink only what is given to her by the man she serves. She sits and lolls, and places dishes, pours, and lights the cigarettes and picks the teeth of the man she serves, and nibbles and laughs when encouraged to do so. Intermittently she leaves and returns with a lute and sings a song or dances. Life in Korea is a man's life and a happy life. The 'keisang' way of life sounds like it hasn't changed much in the last 60 years. I've only read the first two chapters of the book - the rest of the book can be read here. "Bla bla bla." Yup, that sums up my job. If I had one, I mean. Thanks, Weekly Chosun. 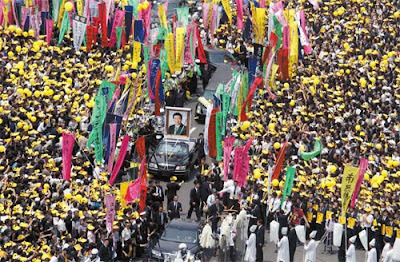 On December 1, they decided to celebrate their victory and display their power by holding a funeral procession for a supporter, Kim Deok-gu, who had been killed the previous week in a skirmish against the peddlers. 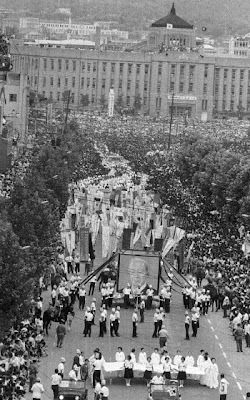 "Tens of thousands" of people joined in the procession and lined the streets to watch the funeral train move from the center of the city, Jongno, to the funeral site at the outskirts of the city wall and then to the burial site. Even though the victim was a mere cobbler, most likely one who weaved straw shoes commonly worn at this time, the funeral rivaled that of any royalty in grandeur and scale. 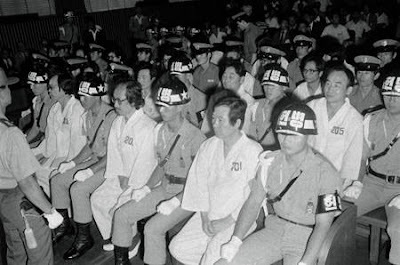 Gojong would go back on his word and most of the people involved with the Independence Club - including Syngman Rhee - would be thrown in prison. 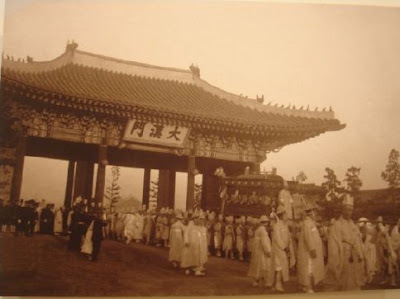 As far as I know, the next large funeral was King Gojong himself, after he died in January 1919. 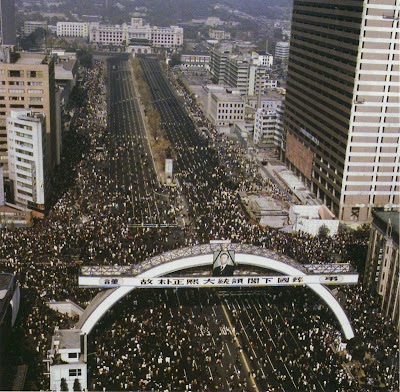 The caption for this photo reads "Crowds gathered in front of Daehanmun Gate the day before Gojong's state funeral." This strikes me as odd, seeing as that day would have been March 2, 1919, and the day before that this same area - present day Seoul Plaza - was filled with people protesting against Japanese rule as part of what became known as the Samil movement. 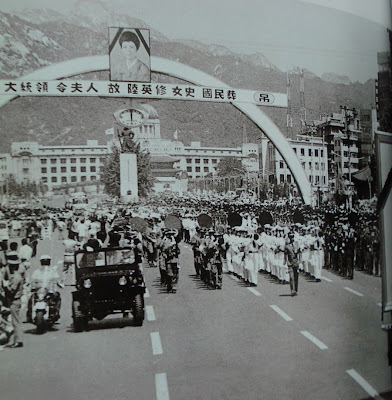 When the funeral took place on March 3 (when the photos below were taken), this site tells us that "the emperor’s funeral was conducted according to the Japanese protocol for state funerals. Consequently, only some seventy Koreans attended the ceremony." 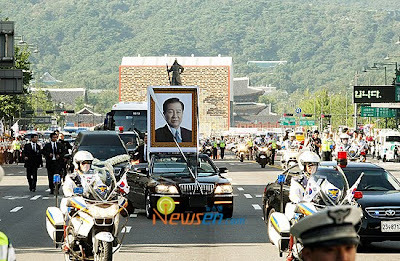 The funeral procession leaves Daehanmun Gate (source). 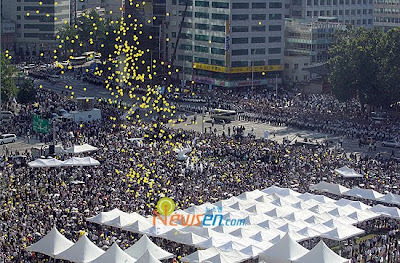 If the photo above is indeed from Gojong's funeral, then it seems to me that there were more than 70 people there. 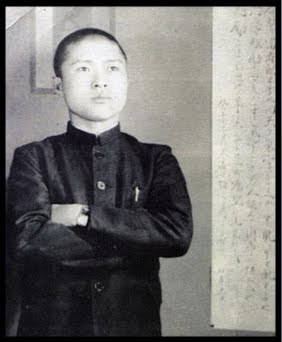 The next large funeral was Gojong's son, Sunjong, in 1926. Sunjong's procession does not seem to have gone through the Gwanghwamun area, and was held on the location of what was Dongdaemun stadium (s). Loads of photos can be seen here. 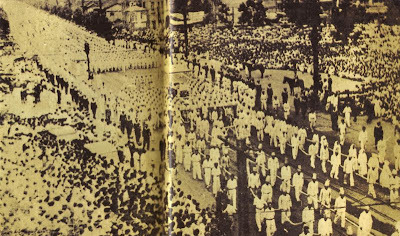 I'm not sure if it was a state funeral, but Kim Ku's funeral, on July 5, 1949, was certainly a huge event, and well attended. 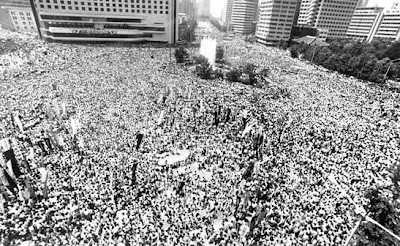 Five years after Syngman Rhee was forced out of office by the 1960 student uprising, he died in Hawaii. 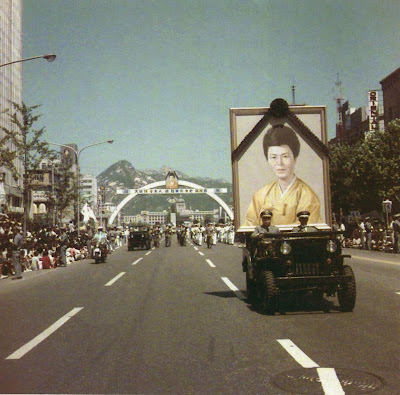 On July 27, 1965, his funeral was held in Seoul. On Liberation Day in 1974, Park Chung-hee's wife Yuk Yeong-su was killed during an assassination attempt against her husband. 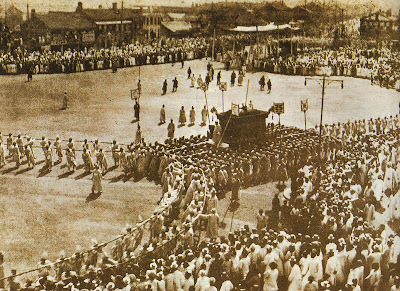 On August 19, her funeral was held; the funeral procession in Gwanghwamun can be seen below. 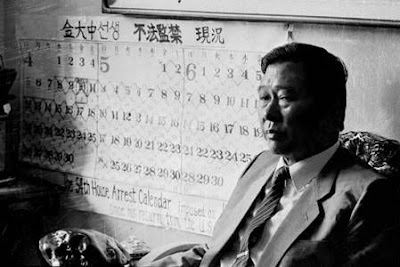 Four years later, Park Chung-hee himself was killed; his funeral took place November 3, 1979. 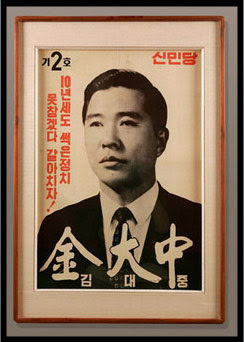 Following Park's death, Chun Doo-hwan rose to power, but his decision to pass the presidency on to Roh Tae-woo after seven years of authoritarian rule led to massive protests which eventually led Chun to concede and allow elections. After this success, a huge, unofficial 'state funeral' was held for a student killed during the protests, much as had taken place in 1898. 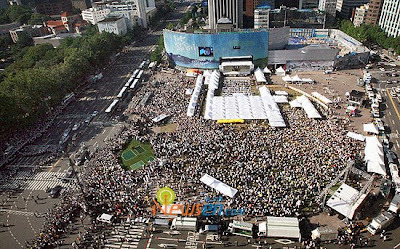 The area in front of Seoul city hall and Daehanmun Gate were filled with hundreds of thousands of people. Note that Daehanmun can be seen in both photos above. ...to cheer the Korean soccer team in the World Cup. A few months later, starting in December, memorial vigils for the girls - certainly not Anti-American protests! - would be held, repeatedly, by crowds of people holding candles. 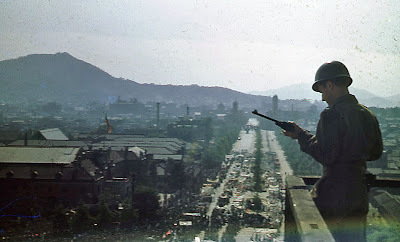 These vigils - with their calls for a renegotiation of the Status Of Forces Agreement between the U.S. and Korea - helped Roh Moo-Hyun into the Blue House. ...unless the Korean team was playing in the World Cup at the time. 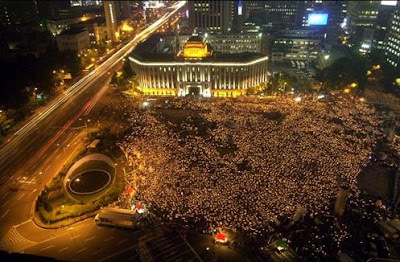 After former president Roh Moo-hyun committed suicide, his funeral was held on May 29, 2009, and involved a great deal of fighting over the symbolic space that Seoul Plaza has come to represent. 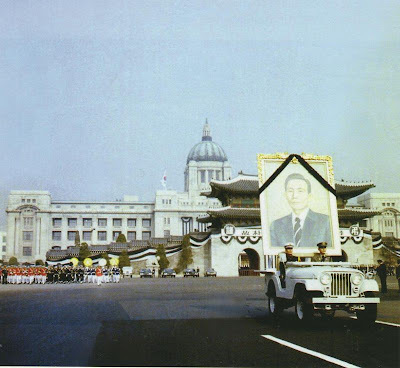 His predecessor, Kim Dae-jung, died last week, and on Sunday, August 23, his funeral was held in front of the national assembly before the funeral procession eventually made its way to Gwanghwamun and Seoul Plaza. 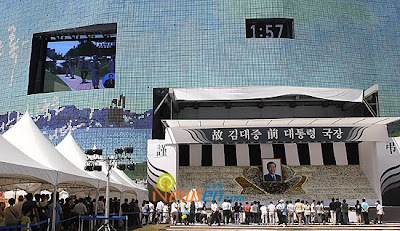 What was interesting about the funeral was that this time (unlike with Roh's death) Seoul Plaza was open for mourners, and they could also watch the funeral on a large screen on the hoarding in front of city hall - reminiscent of the crowds watching the world cup in the same space in 2002 and 2006. 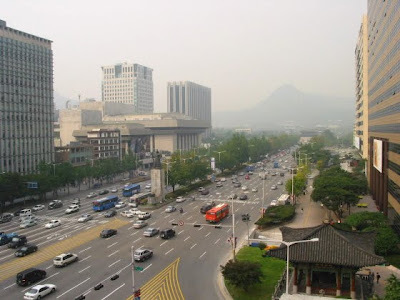 Above can be seen the mourners at Seoul Plaza, and beyond them, Daehanmun Gate, the place where modern Korean protest culture began 111 years ago, and where the body of the protesters' adversary, King Gojong, left as part of a funeral procession in 1919. 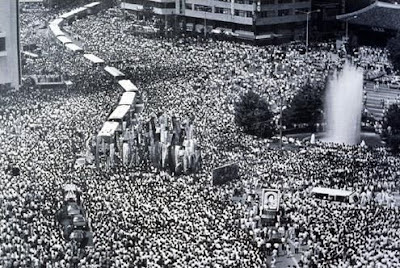 Worth remembering too is that it was his funeral which influenced the timing of the Samil protests, which contributed further to Korea's protest culture. The other day, Korea Beat translated an article about the acceptance of refugees in Korea. I wrote about this four years ago, so it was interesting to see how the numbers have changed. South Korea became a signatory of the International Convention on Refugees in 1992, but did not admit any refugees until February 13, 2001, when it recognized a 26-year-old Ethiopian man. (At that point, a total of 104 people had sought asylum in South Korea since 1992.) It was not until late December 2002 that a second person was granted refugee status in Korea, this time a Congolese dissident. In late January 2003, 4 more people, three from Myanmar and one from Cameroon, were recognized as refugees. 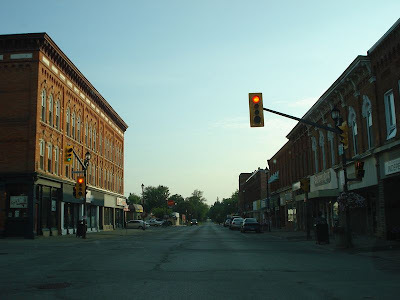 By July 2003, the number had grown to 12, with 2 more being accepted by the end of the year; 17 people were accepted in 2004, bringing the total to 31. At that point, 360 people had applied to stay in Korea as political refugees; fifty-one withdrew their applications, while the government rejected 61. In our country, from 1994 to last June a total of 2,336 people have applied for recognition as displaced persons, with just 116 of them receiving such recognition. So, in the last four-and-a-half years, 85 more people have been accepted, as compared to 31 in the four years between 2001 and 2004 (or 31 in the 12 years between 1992 and 2004!). Unfortunately, with almost 2000 more people applying for refugee status in the last four-and-a-half years, the odds have seemingly gotten worse, though it's difficult to be sure without knowing how many cases the courts have actually dealt with. The statement above may sound like it is made with the assumption that all of the cases are genuine, but this is not always the case, of course. Examples of some of these cases, with the court's decision, can be found here (do a search with no keyword to turn up all of the ten or so cases there), while the case that got my attention in 2005 is here. 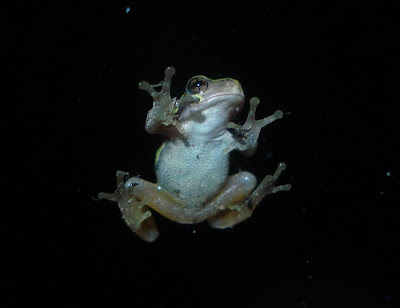 I took these photos about an hour ago, when I looked and saw this little tree frog on the glass of the patio door. 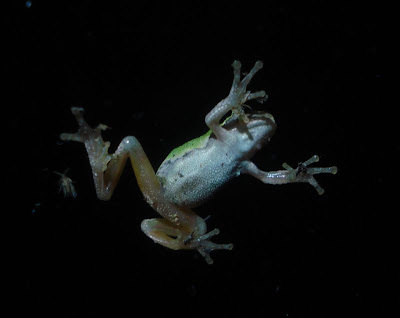 About the only time I saw one in Korea was on the window of a Family Mart in a rural part of Wonju. 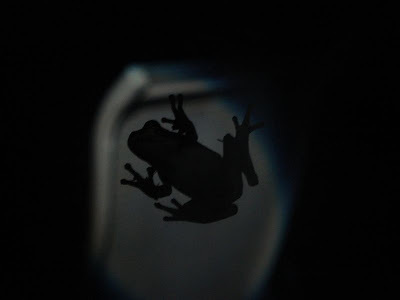 Insects, like the one behind it in the last photo, were drawn to my flashlight, which gave the frog lots to eat. I tried to video it eating, but didn't have much luck. 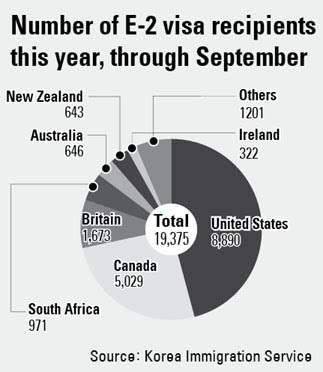 I haven’t had time to post much this summer, but it dawned on me the other day that there are several things related to the E-2 visa issue that I never got around to posting back in June, so I’ll address some of them today. On June 5, the Chosun Ilbo (Korean) reported on Ban Ki-Moon's comments recommending Korea abandon it's HIV immigration policy (the article mentions the visa requirements for foreign teachers as an example). The Korea Times also reported this. June 19 saw the submission of a letter to the National Human Rights Commission by Human Rights Watch, which can be read here. Another thing I never got around to posting is that I was right about this. When Choi Young-hee submitted her three bills regarding foreign teachers to the National Assembly, she said Korea had a total of 38,822 E-2 visa holders in 2008, but that 22,202 were not accounted for. I knew she had the wrong figures, and by searching through the immigration website, I finally found immigration statistics of many types at its English language site. In the center of the page under ‘Immigration Focus’ is “News Release > Publications”. Click on Publications and click on "2008 KIS statistics." Ignore “2008 KIS STATISTICS (← Click Download)” and click on “2008 KIS Statistics(excel).zip” instead. In the zip file are many excel files. “1장_Ⅱ_1.외국인입국자(국적.자격별)_” shows entry and exit of foreigners in 2008 by country and visa type. 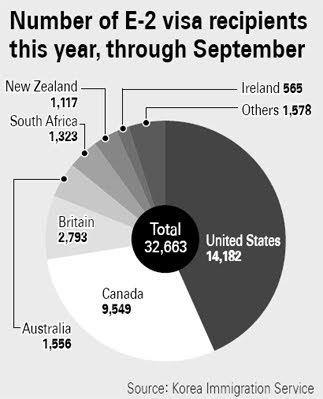 Under E-2 visa, we find the figure 38,822. Choi’s office used the wrong statistics. The Excel file “2장_Ⅱ_체류외국인현황” has the true end-of-2008 E-2 statistic of 19,771. Just to confirm that I was correct, I sent the excel files to Benjamin Wagner, who contacted immigration. They confirmed that Choi’s office had made a mistake, and they weren’t too pleased with having been accused of losing 22,000 E-2 visa holders. Others have made similar mistakes. The Joongang Ilbo used the wrong statistics in its chart here until they were corrected recently after Ben Wagner contacted them. Y' know, you'd think that a member of the National Assembly - with all the aides and support that entails - would check a little more carefully before going to the media with information that could potentially panic people and make a government ministry look bad. Also, it strikes me as worrisome that a member of the National Assembly had to be corrected by an English teacher with a blog and a foreign law professor. On the other hand, you can be certain that the media isn't going to double check this stuff. If we don't do it ourselves, who will? 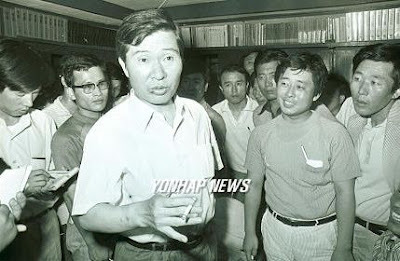 Old age and illness have done what assassination attempts - by vehicle, kidnapping (in 1973), and trial (1980), carried out under two dictators, Park Chung-hee and Chun Doo-hwan - could not. The other day, Chun tried to visit Kim in the hospital, but was unable to meet him. Perhaps he wanted to thank Kim for pardoning him from a life sentence in 1997, something - I've read somewhere - Kim said he would do back in the '80s if he had the chance. Still, considering that he had Kim sentenced to death in 1980, he probably wasn't the most welcome person at the hospital. Whatever you think of his presidency, he stood up for democracy in Korea at a time when to do so meant possibly risking one's life. I was re-reading some old posts looking for something the other day and ended up coming across an episode I'd forgotten in my first post about western explorers' visits to Korea. This story is related in Basil Hall's A Voyage of Discovery to the Western Coast of Corea and the Great Loo-Choo Island in the Japan Sea, 1818, which can be viewed here (download the plug-in). 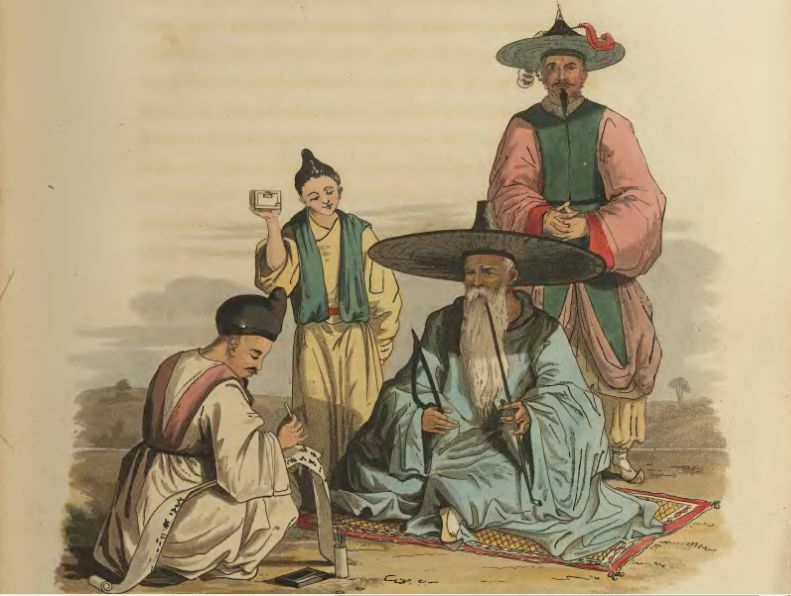 The book relates Hall's visit to the coast of Korea in 1816; compared to some later explorers, Hall's expedition generally tried to follow the Korean desire to have, well, nothing to do with outsiders (though I should note that that was the desire of Korea's rulers - not necessarily of Korea's people, who were often curious to interact with the foreigners, when they were not being watched by others). I turned round and exclaimed “Patience Sir!” he drew back… and a moment after called out himself, “Patience Sir!” The others hearing this caught the words too, and nothing was heard for some time amongst them but “Patience Sir,” pronounced in every instance with perfect propriety. They seemed surprised themselves on discovering powers of imitation hitherto in all probability unexercised. This incident brought us better acquainted, and we remained on the top of the hill teaching them English words till it was dark. 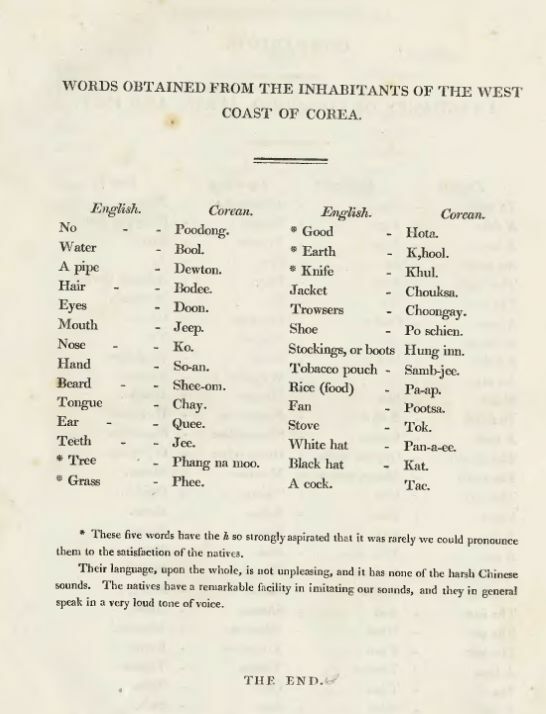 It's interesting to be able to identify a number of words in use today; errors may be due to Hall's men mis-hearing the Korean words, or due to pronunciation which was different than today. We provided them with brushes to write and their writing resembled like mountains covered with clouds. Though pictures were drawn, we still could not understand. 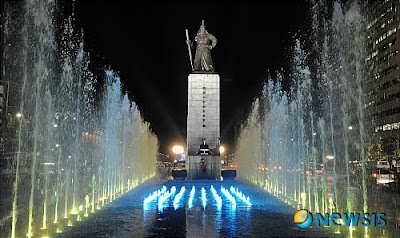 I guess I missed the opening of Gwanghwamun Plaza, which doesn't look to be influenced by Cheonggyecheon at all. From the photo above, it looks to be an all right makeover. It's nice to know that King Sejong will be joining Yi Sun-sin at Gwanghwamun, even if he's taking a back seat to him. It looks nice enough, but masks a perhaps unhealthy obsession with history-related numbers. 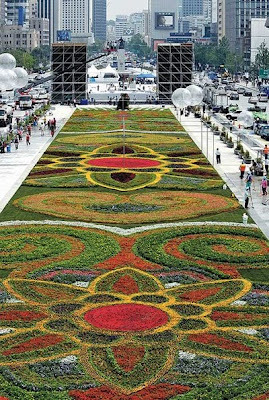 The Square features a 162 m long and 17.5 m wide flower carpet consisting of 2.24 million flowers. 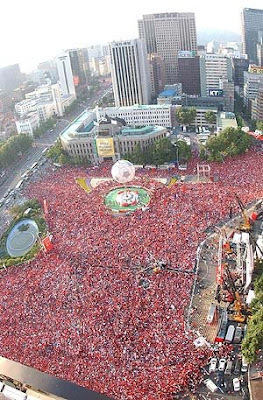 The exact number, 224,537, represents the number of days from Oct. 28, 1394, the day when the Chosun Dynasty moved the capital city to Seoul, to the opening day of the square. Whose idea was it to calculate that? Has anyone checked to see if there are actually that many flowers there? 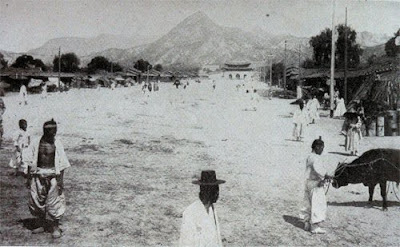 Reconstruction of the plaza was undertaken not only to give the area an aesthetic upgrade, but also to restore it to its original state prior to the Japanese colonial era (1910-45). In fact, if you read the rest of the above passage in the article, there is nothing about what this plaza has restored. Except for one thing. Now, how did the city "remov[e] traces of the Japanese colonial era"? A total of 29 gingko trees that had lined Sejongno since the early part of the Japanese colonial era were removed in an effort to root out the remaining traces of Korea’s painful past. Fourteen of them were replanted near Simin Yullin Madang, a park near the Ministry of Culture, Sports and Tourism in central Seoul, and 15 were replanted in front of the Central Government Complex. Wow. So they moved 29 Gingko trees. That must have been cathartic. 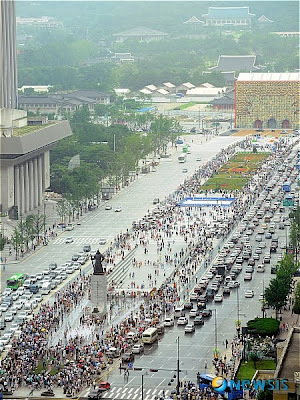 When the city opened Namdaemun's doors in 2006 so that people could walk through the gate, the public was told that it was the first time in 99 years that the doors had been opened since the evil Japanese began destroying the wall surrounding the gate. The only problem with this was that it wasn't true - there are photos showing it open over the years, even as late as 1960. I get the feeling that Gwanghwamun plaza is being sold to the public as a reclamation of the nation's diginity in a similar way, except much lamer. I mean, gingko trees? 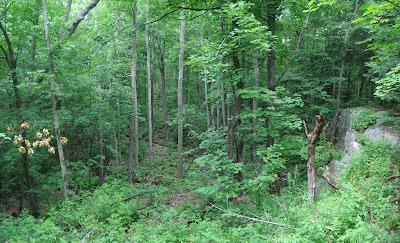 It's hard to know when the trees were planted, but it was likely either in the mid-to-late 1930s or 1940s. I guess if you wanted to link their planting to the worst period of Japanese militarism, you could, but no one has, and I can't help think people are being sold a false nationalist bill of goods in the marketing campaign for the plaza. Of course, it's certainly not the first time, and you have to wonder why it's thought to be necessary. Another thing that's interesting is how urban projects are marketed by announcing that they will restore the past, when they do nothing of the sort. 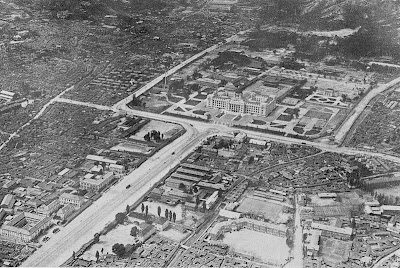 One of the more glaring examples of this was Jongno Town, which saw a stretch of Pimatgol destroyed to make way for it. 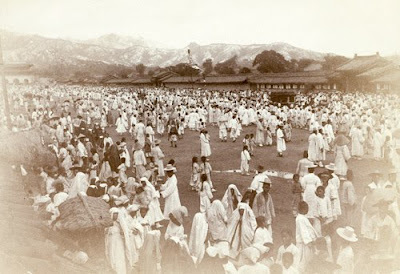 A poster advertising it had written on it "Pitmagol is reborn!" I'll save that for another day, however. And as long as the live music scene is not a viable route to becoming a star in Korea, the local music scene will remain dominated by the music labels and manufactured pop music. The entire post is well worth reading, as is his book, Pop Goes Korea (I'll take a lengthier look at it another time). Mark also posts about Kim Ki-young's 'The Housemaid' finally coming out on DVD, which is very, very good news, and will be my first purchase when I get back to Korea. The government cracked down on female workers from the YH factory holding a strike in the opposition party headquarters, which left one woman dead. 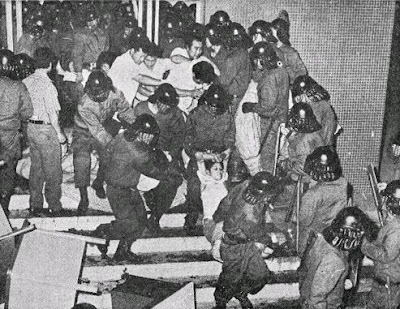 When Kim Young-sam used this to gain sympathy and began promising to bring down Park Chung-hee's government, he was stripped of his membership in the national assembly, which led students and citizens to protest violently in his hometown of Busan and Masan, which led to the argument between KCIA head Kim Jae-gyu and Park Chung-hee's underling Cha Ji-cheol on how to deal with such protests which led Kim to kill Park, which led to the ascension of Chun Doo-hwan and the Kwangju Uprising. 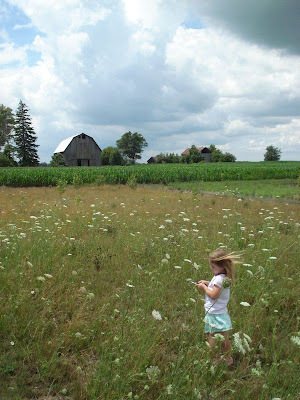 I dealt with this in a little more detail in this very old, unfinished post. An essay (I haven't read it yet) about women's labor movement and democratization in Korea is here. How do blogs shape community identity among expats in Korea? My dissertation will examine the role of blogs in helping to form and shape a sense of community identity amongst expats living in South Korea. This is being done in order to determine the archival value of these blogs and examine if, and how, they should be preserved. 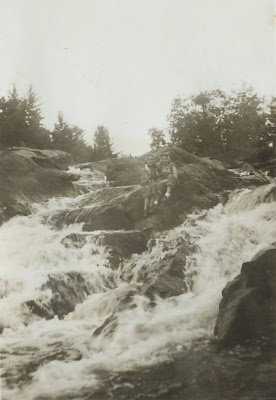 Basically, I believe that today’s archives are rife with personal diaries and papers which allow us a glimpse into the past. But, what of the archives of the future? How many people today actually keep a pen and paper journal or write letters home? More and more native English teachers living in Korea have replaced diaries and letters home with blogs. 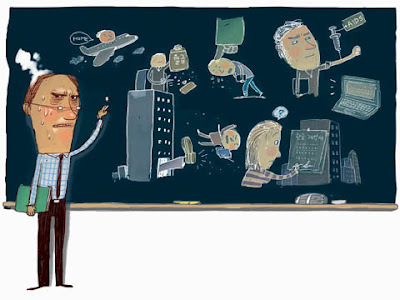 Furthermore, due to the nature of the native English teacher community in Korea, much of the information about this community can only be found on the Internet on sites such as blogs (like yours). 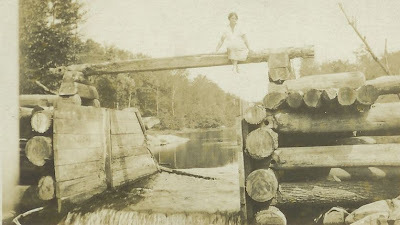 Therefore, a failure to preserve blogs may create a black hole of information for future generations of archives users. http://2009msc.wordpress.com. It sounds like an interesting project, so take some time to help her out by filling out the questionnaire. I've been busy on my vacation at home in Canada, and it's been a little aggravating using dial-up internet (though today I have access to high speed at my sister's in Montreal). The weather had been cool and rainier than usual, but knowing what the weather is like in Korea every summer, I haven't complained at all. 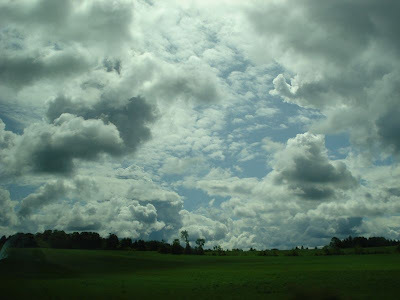 One thing that struck me at home were the clouds. I guess if I noticed them so much it means you just don't see clouds like this in Seoul that often. 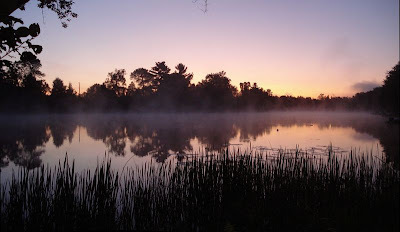 The dawns are nice, too. Above are photos at my friend's place in Ridgetown, Ontario. Below, on the left, is what was once a theatre there, but which is now condemned. Here's what it's like inside, at night. I'm enjoying the wildlife as well. 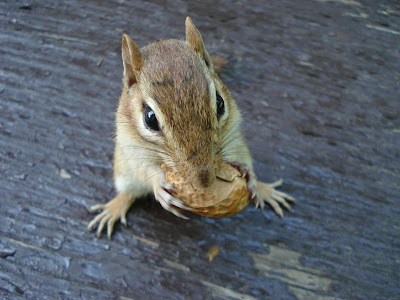 Okay, the chipmunk isn't so wild, seeing as you can feed it. 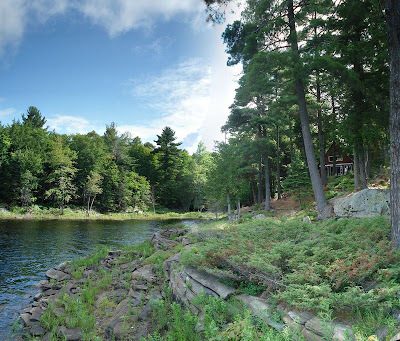 Above are shots around my family's cottage near Parry Sound, Ontario. 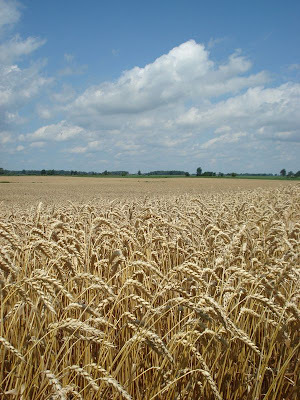 The only reason we're able to have one is because my great grandfather bought land there in the 1920s. 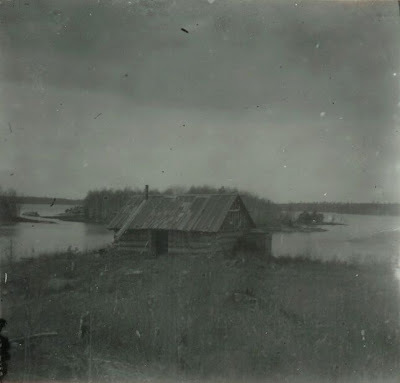 He started visiting the area in the late 1880s, when he stayed with relatives and friends who had built homesteads there (the photo of the one below was taken a hundred years ago). I have letters from 1918 that my great grandmother wrote from the house above, saying that she had to end the letter because their toddler wanted to play with the only pencil in the house. 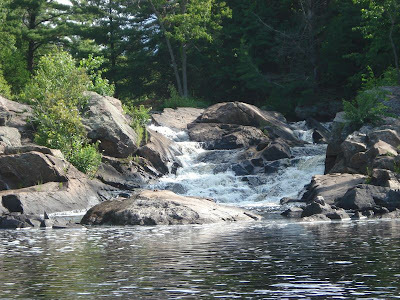 This area was logged 100 years ago and at the time a dam was built above the chutes to control the flow of water. 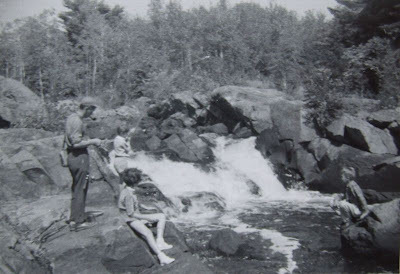 ... and below is my mom there in the 1950s. The photos above are the fruits of long hours of scanning hundreds of photos several years ago. It's nice to have them all at my fingertips. Not much Korea-related stuff to report, other than finding Philip Deane's 'Captive in Korea' (by a journalist held by the North Koreans and Chinese during the Korean War) in a bookstore yesterday, just before catching Park Chan-wook's 'Thirst,' which was... okay. It was nice to be able to see it in a theatre in Canada.